In the wake of public outcry over the failure of prosecution in Jessica Lall murder to nail down the accused wielding political and money power, Prime Minister Dr Manmohan Singh today expressed serious concern over criminal cases falling flat in courts. Should the income tax exemption limit for senior citizens be raised from Rs 1.85 lakh to Rs 2 lakh? While expressing opposition to the proposed National Judicial Council, Chief Justice of India YK Sabharwal today refused to buy the argument that there was confrontation between the judiciary and the legislature in view of Lok Sabha Speaker Somnath Chatterjee’s assertion that he would not submit to the jurisdiction of the Supreme Court on the issue of dismissal of MPs in the “cash for query” scam. Prime Minister Manmohan Singh today told Parliament that India had not accepted a cap on its strategic nuclear capability while clinching the civilian nuclear deal with the USA. He reiterated that India’s separation plan under the Indo-US nuclear deal would not adversely affect India’s strategic programme to maintain a minimum credible deterrent. A serving Colonel has been held blameworthy for loss of highly sensitive military information, which was reportedly passed on to Pakistani intelligence by an Army jawan posted as a clerk in his office, it is learnt. Acting on a tip-off from alert passengers, the anti-terrorist squad of the Mumbai Police recovered a crude bomb at the Byculla railway station in Central Mumbai this morning. 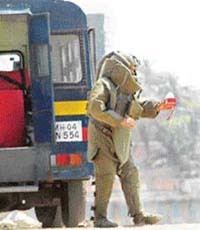 A bomb squad expert carries the explosive in a water bottle found at Byculla station in Central Mumbai for defusing in Mumbai on Saturday. The Communist Party of India (Marxist) (CPM) today categorically said it would decide about its chief ministerial candidate in Kerala only after the poll while in West Bengal, sitting Chief Minister Buddhadeb Bhattacharjee is the obvious choice for the top job in the state after the election.